Lt. Col. Mark L. Inaba will be giving the memorial address at the 63rd annual Memorial Day service at Evergreen Cemetery, 204 N. Evergreen Ave., Boyle Heights. The service for the Southland’s Nikkei veterans of all wars will take place on Monday, May 27, from 11 a.m.
Inaba is a deputy staff judge advocate, serving with the 40th Infantry Division of the California Army National Guard. His military awards and decorations include the Bronze Star, Meritorious Service Medal, Army Commendation Medal with Oak Leaf Cluster, Army Achievement Medal, Air Force Commendation Medal, Iraq Campaign Medal, Armed Forces Reserve Medal, NATO Medal, Parachutist Badge, and Kosovo Campaign Medal. Floral tributes will be offered by Consul General Jun Niimi, as well as community organizations and veterans groups. Ron Yamada will serve as emcee. 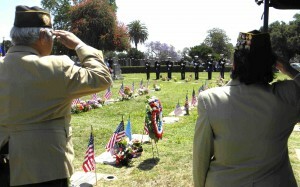 The Military Intelligence Service Veterans Association of Southern California, as part of the Nisei Veterans Coordinating Council, and Evergreen Cemetery invite the public to help pay tribute to those who paid the ultimate sacrifice, allowing us to enjoy the freedom we have today.